Ode to Zone Runner. With ooouuuttttliiiinneees. And bad animation. Also uses slightly irritating/unfitting stock samples from the TGF libraries. Just like the original! I started this for the KotM #33, but didn't get finished. So I decided to go over the two hour period to bring you this. 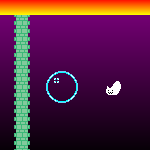 There are ten levels in total: nine normal levels, and one boss(!!!) level. Most of the stages are designed to be quite daunting, and they also poke fun at some of the design flaws and eccentricities in the Zone Runner games. You get unlimited lives since some stages are a bit... unfair. Made in MMF2. Needs DirectX 8 hardware acceleration to run. And 1280x800 resolution or higher. Don't worry, Circy. You're still an awesome guy. Ode to Zone Runner. With ooouuuttttliiiinneees. And bad animation. Unfinished, as I had to leave early. Might finish it up eventually. Or something. If it's worth finishing, anyway. The lighthearted adventures of a boy and his favourite nonhuman companion.